With great confidence?its HEREDEZ! 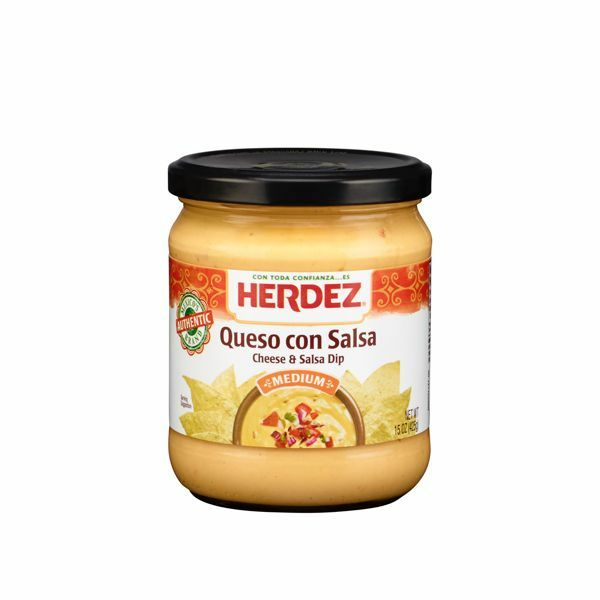 Queso Dip brings the authentically bold flavors of Herdez salsa and rich creamy cheese in one delicious jar that is sure to liven up any snack. Fire up your appetizers and snacks with an irresistible burst of flavor. Be the life of every party & gathering with Herdez Queso con Salsa dip. . Perfect to dip or spread on tortilla chips and crackers. 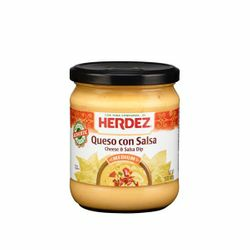 Can also be used as a flavorful topping for authentic Mexican recipes. .
Open a bag of Herdez, Doritos or Tostitos flavored tortilla chips and enjoy them with Herdez Queso dips. Ingredients: Water, nonfat milk, monterey jack cheese, vegetable oil (corn and/or soybean), maltodextrin, modified corn starch, green chilies, red bell peppers, salt, tomatoes, natural flavor, jalape?o peppers, sodium alginate, xanthan gum, sodium phosphate, vinegar, sodium citrate, mono & di-glycerides, sorbic acid (preservative), monosodium glutamate, and artificial color (FD&C yellow #5 and yellow #6). Con toda confianza?es HEREDEZ! El ?Queso Dip? combina los sabores autenticos y picantes de la Salsa Herdez y queso cremoso en un envase delicioso que promete darle un increible sabor a cualquier botana. Enciende tus botanas y aperitivos con un irresistible estallido de sabor y se el alma de la fiesta con ?Herdez Queso con Salsa Dip?. Es perfecto para comer con chips de tortilla o galletas saladas. Tambien puede ser utilizado como unsabrosisimo topping para recetas autenticamente Mexicanas. Abre una bolsa de chips de tortilla de la marca Herdez, Doritos o Tostitos y disfrutalos con los QuesoDips de Herdez. Ingredientes: agua, leche descremada, queso Monterrey Jack, aceite vegetal (maiz y/o soja),maltodextrina, almidon de maiz modificado, chiles verdes, pimiento rojo, sal, tomates, sabor natural, chile jalape?o, alginato de sodio, goma xantana, fosfato de sodio, vinagre, citrato de sodio, mono y digliceridos, acido sorbico (conservador), glutamato monosodico y color artificial (FD&C amarillo #5 yamarillo #6). I have tried Tostitos, Taco Bell, On The Border, and Herdez and this is the best one! My whole family agrees that this is the best out of all of them. ProsLove everything. Flavor and texture are great!!! I usually make my own...cause you know home made is "better." This brand is awesome. Not only do we have it with tortilla chips, it's great with vegetables, too. Broccoli, cauliflower, baked potatoes...Give it a try. You won't be disappointed!! This is the best queso dip except for homemade that I have ever tasted. Keep your Paul Newman's, your Taco Bell, your On the Border, try Herdez. WONDERFUL! Best pre-made queso dip I have ever tasted. WONDERFUL! IF you can find it, BUY IT! And I love queso dip to eat everyday! ProsCan't find it in enough places. One jar and now I am hooked, but I can't find it in Wal-Mart, Kroger, Tom Thumb, Albertson. I found the Salsa dip, but not the queso. Please send us more to TEXAS!